See News notice on this page, the Study Guide (PDF), and Practice Test. View the National Entry-Level Competencies for Registered Psychiatric Nurses (PDF) and News Release (PDF). RPNRC is not itself a regulator. Rather, each member has a provincial mandate to protect the public by regulating RPNs to be safe, competent and ethical. Through RPNRC, the members collaborate nationally to achieve excellence and consistency in provincial regulatory requirements and processes. RPNRC is incorporated under the Canada Not-for-profit Corporations Act. It is a virtual organization, existing online without an office. The Registered Psychiatric Nurse Regulators of Canada (RPNRC), in collaboration with our exam testing partner, Yardstick Assessment Strategies (YAS), is pleased to release two new tools to assist Internationally Educated Nurse applicants and Canadian psychiatric nursing graduates to prepare to write the Registered Psychiatric Nurses of Canada Examination (RPNCE). Read more (PDF). 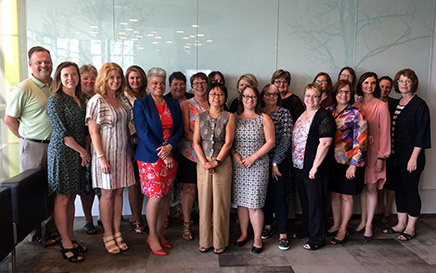 The inaugural Forum of Canadian Nurse Regulators was held July 6 in historic Montreal, Quebec. Licensed Practical Nurses (LPNs), Registered Nurses (RNs), and Registered Psychiatric Nurses (RPNs) regulators met for the first ever gathering of nurse regulators in Canada to learn more about the Canadian Council for Practical Nurse Regulators (CCPNR), Canadian Council for Registered Nurse Regulators (CCRNR) and the Registered Psychiatric Nurse Regulators of Canada (RPNRC) and to exchange knowledge and information. Common priorities and issues were explored as potential opportunities for nurse regulators to work together in the public's interest. A fraudulent exam preparation guide for the Registered Psychiatric Nurses of Canada Examination (RPNCE) is being sold online. The following website http://www.rpncestudyguide.com/?gclid=CIPaspPyydECFQeSaQodGDwCdw purports to sell a prep guide with "questions sourced from actual previous RPNCE exams." There is no such prep guide. The RPNCE is the property of the Registered Psychiatric Nurse Regulators of Canada (RPNRC), which is composed of the four Registered Psychiatric Nurse regulatory authorities for British Columbia, Alberta, Saskatchewan and Manitoba. The RPNRC has not yet released any online or paper prep guides or practice tests for the RPNCE, nor has RPNRC endorsed a prep guide put out by another group. Please use extreme caution in purchasing any prep guide that promises to prepare you for the RPNCE. If you need more information, please contact the regulatory body in your jurisdiction. It is with sadness that we announce the passing of Robert (Bob) Allen, Chair of RPNRC and Executive Director of the Registered Psychiatric Nurses Association of Saskatchewan. Bob's contribution to the psychiatric nursing profession will be missed. We extend our condolences to the RPNAS Board and staff and to Bob's family and friends. The Registered Psychiatric Nurses of Canada Examination (RPNCE) is a multiple-choice, paper and pencil exam that has been designed to test the entry level competence and safety to practice of new graduates and internationally educated applicants who are seeking registration as a Registered Psychiatric Nurse in Canada. The 2015 implementation of the new Entry Level Competencies for the psychiatric nursing profession in Canada required that a new blueprint be developed for the RPNCE. The new blueprint will be implemented in May 2016. At the same time, the total number of questions on the RPNCE will be decreased from the former 230-250 items (over two books) to a single, 4 hour exam of approximately 200 questions. The decreased number of exam items remains in line with industry standard for testing and measurement. The RPNCE is offered three times a year in January, May and October. Applications for the John Alex Crawford National Scholarship can now be completed online at the Registered Psychiatric Nurses Foundation website at www.rpnf.ca. For more information, find more details on our Awards and Scholarships page.